Howard Wilkinson becomes WVXU's senior political analyst on Feb. 1. The one and only Howard Wilkinson bobblehead, a Christmas/birthday gift from a co-worker last month. "It was time to say, OK, there are certain things I want to do, and certain things I don't want to do," says Howard, who turned 66 in December. Listeners will still hear Howard every Monday morning chatting with News Director Maryanne Zeleznik, and on monthly Cincinnati Edition shows with "Political Junkie" Ken Rudin, and whenever his analysis or perspective is needed for local or national issues. He will continue writing his weekly Politically Speaking column on Wednesdays and Tales from the Trail on Friday. "We are happy that Howard will remain with Cincinnati Public Radio as our senior political analyst, providing the insights and context that only someone who has been in the trenches for so long can," Zeleznik says in the station announcement being released today. Howard joined Cincinnati Public Radio in April 2012, after working 30 years for the Cincinnati Enquirer. His newspaper career started in 1976, after we worked together at The Post, Ohio University's student newspaper. Soon Cincinnati Public Radio will hire a new general assignment reporter to join reporters Jay Hanselman (City Hall), Ann Thompson (science and technology), Tana Weingartner (Hamilton County Commission), Bill Rinehart (general assignment) and digital editor Jennifer Merritt. One more change coming to WVXU: On Feb. 4, Michael Monks debuts as Cincinnati Edition host, when the talk show moves to noon weekdays. Howard at the White House with the Obamas in 2009. Howard will be hard to replace. He's done it all – breaking news, profiles, in-depth stories and quick stories for the web. He knows everyone and everyone knows Howard. He's done interviews in the White House. 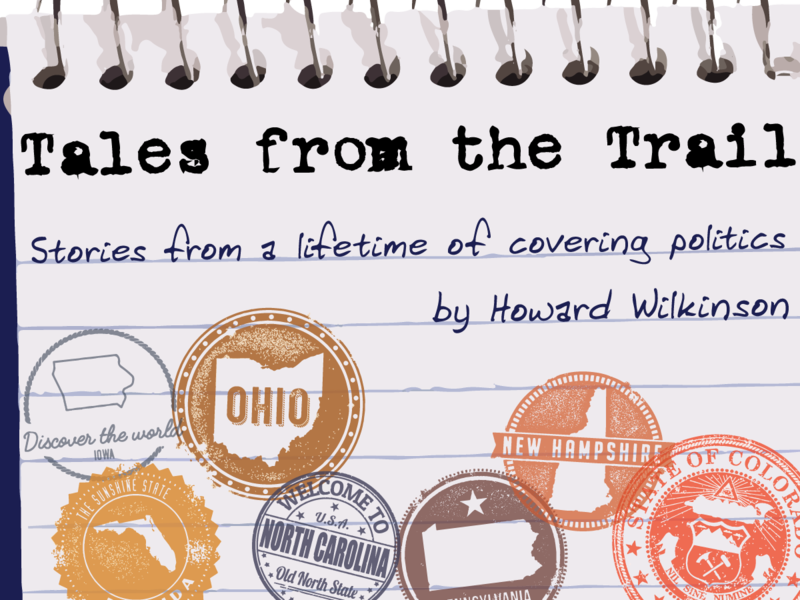 He's covered every Ohio gubernatorial race since 1974, as well as 16 presidential nomination conventions. He was honored in 2017 for his career covering Ohio politics, and inducted into the Cincinnati Society of Professional Journalists Hall of Fame in 2012. 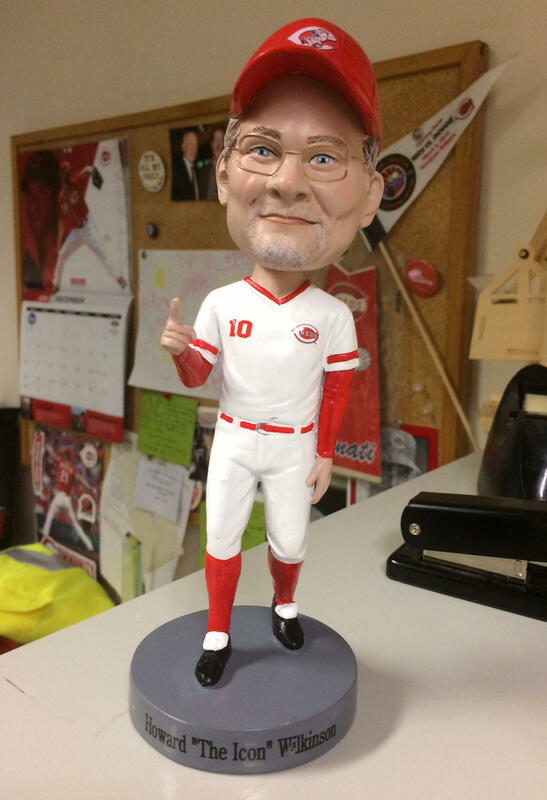 "After spending most of the past 45 years in the somewhat frenetic world of political journalism, it's time for me to pull back a bit and have more time to think about politics, write about politics and – not incidentally – have a lifestyle where I don't always have to give away my tickets to Reds' weekday games at GABP," Wilkinson says. "When I think back on it, I have had some amazing opportunities in journalism, reporting on everything from presidents to so-called 'ordinary' people who are anything but ordinary. I'm looking forward to many more such stories in my new role with WVXU and Cincinnati Public Radio." 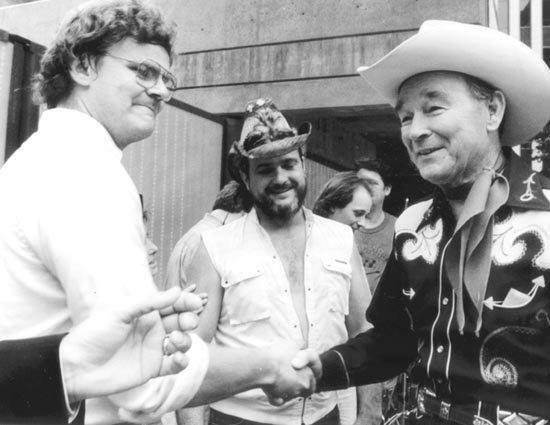 Howard with boyhood idol Roy Rogers in 1988. As I wrote when he was honored in 2017, Howard isn't just a politics reporter. He writes about baseball, especially his beloved Reds, present and past. He writes about battlefields and wars dating back to the Civil War; war veterans and their issues, concerns and heroics; prisoners of war like Staff Sgt. Keith Maupin; and famous people ranging from John Glenn to Roy Rogers. Howard loves history so much that he vacations by walking the battlefields at Gettysburg, not the beaches at Destin. Every year I'd get jealous for two reasons when the Enquirer Metro editors kept asking Howard to write the big Opening Day feature story – because he got the assignment, and because he did it 100 times better than I ever could. That's Howard. He's one of a kind. Take it easy my friend, and see you at the ballpark. 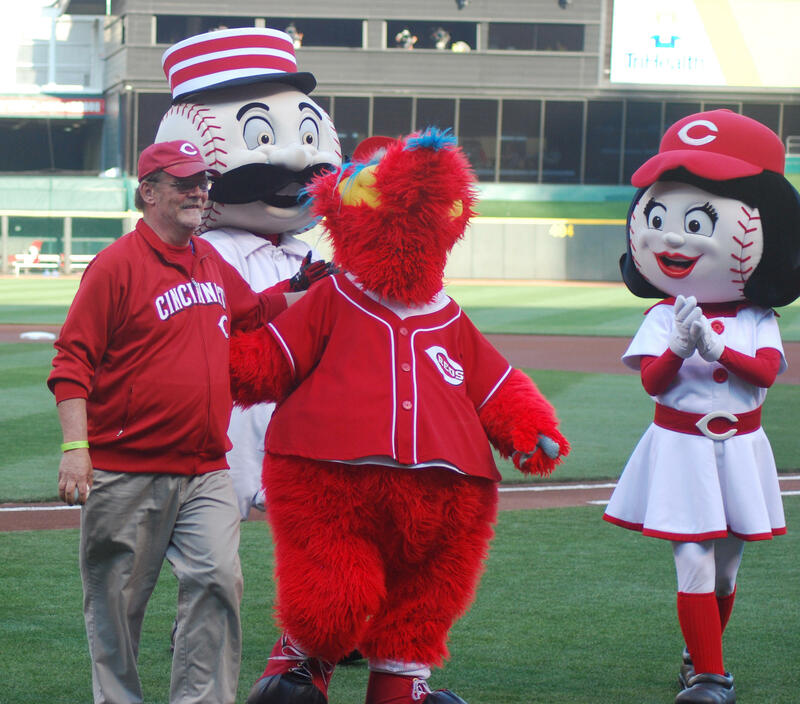 Howard Wilkinson with Reds mascots after throwing a ceremonial first pitch in 2012.